Lacta, a Greek Chocolate brand owned by Kraft, has created a mobile app for Android and iOS that allows you to send love messages and see them appear on a chocolate bar. The app was created by OgilvyOne Worldwide, and works by detecting the Lacta logo on the chocolate bar and replacing it with a customizable message. The technology behind it isn’t too complex, but the implementation looks very clean and realistic, and suggests a new way for couples to interact with one another — particularly if they live far apart. Unfortunately for most of us, the app is currently only available in Greece, but as augmented reality becomes increasingly common, you should expect to see this type of campaign spread throughout the world. I can see this being especially lucrative during Valentine’s Day. As far as the usefulness of the app goes, it’s a little strange that your lover/friend will have go out and buy the chocolate beforehand (or you’ll have to give it to them, then they’ll pull out their phone). It would be nice if the app also allowed users to purchase a bar and send over a redeem code to be scanned at a store. They begin by composing the message on the Lacta app, which also shows how it will appear on a Lacta bar. Next, they select the name of the friend they’d like to send it to from their list on Facebook. 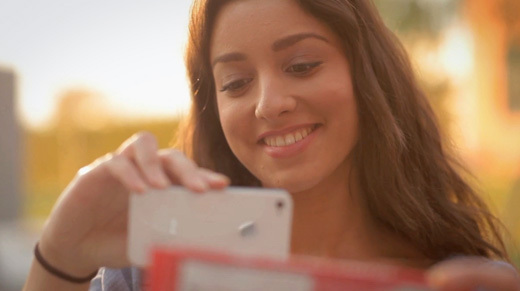 Finally, the recipient receives a Facebook notification, and once they download the app, the camera of their phone automatically turns on and can be used to reveal the message on any Lacta chocolate bar. This isn’t the first time we’ve seen mobile technology targeted at couples, and it certainly wont be the last. You might also want to check out these 4 startups that show how technology brings couples closer together.